With this new model of an untypical serial number Nokia enters a budget market sector. Before that the company had no cheap GSM phones because the popular 3xxx series belongs to a middle class and its models have a respective price in the beginning. The need in production of inexpensive phones is on account of the current market state. There is the only way to make sparing European users replace their low-cost phones subsidized 2-3 years ago, - this is to offer them cheap and modern handhelds instead. Besides, the price range of the mainstream models in Europe ($180-250) is too high for poorer countries which mostly deal phones not dearer than $100-120. Earlier such markets were stuffed with phones taken out of production, today they can also give a manufacturer stable though rather low profits. For Nokia this is rather a preventive step because its business is very profitable and doesn't need such financial support. But if Nokia doesn't strengthen its position in this low-end sector today, competitors will do it tomorrow. Consumers will certainly benefit by receiving a modern phone of the popular trade mark at a rational price. Nokia 2100 is a compact featherweight. Its dimensions and weight comply with the unwritten standard of an up-to-date budget phone. It's smaller and lighter than one of the most popular inexpensive solutions - Siemens C45. Only Sony Ericsson T100 have these parameters better. Nokia 2100 utilizes some propriety solutions. The company offers personilized covers to stress your style. You can remove the front and back panels, and the keypad. The panels do no embrace the phone entirely, but only its front, back, top and bottom, while the sides make a single whole with the base unit. In our model the base is light gray (it seems that all production samples will have this color), the covers are made of blue semitransparent matte plastic, and the keypad is rubber with a while pearl surface. The covers and side panels are pleasant by touch, but the keys are a bit sticky when you touch them with wet fingers. The front panel catches on the basic unit with two pairs of protrusions. The back side attaches to the front one with the same juts underneath, and with a latch above. Thus, the removable covers embrace the base unit and additionally hook to it in the center. The hooks are quite tight though they don't turn assembling into a torture. The design has no backlash (though it crackles a little when compressed in a hand) and is not going to loosen with time because you clamp mostly the side panels. The design seems to be quite reliable. There's a photo-insert on the back covered with transparent plastic where you can keep a picture or a photo. This is one of the most popular design features today. 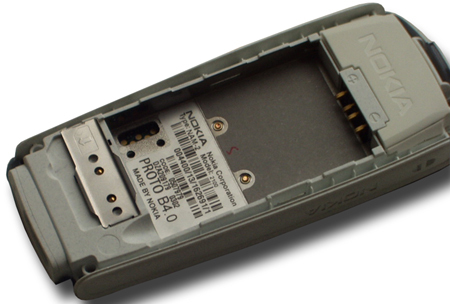 Nokia 2100 comes with a Li-Ion battery BLD-3. It sits in a socket and is fixed just with spring pins and the phone's back panel which is covered with rubber inside. A SIM card's slot is plain coupled with a fixed clamping strap. A SIM card can be taken out of its slot even if the battery is in its place. It's not the best solution, - they should think of a more reliable foolproof design which wouldn't let the card out without turning power off. The slot design and battery compartment also look reliable. The keypad consists of a digital unit, a two-way scroller, a couple of soft keys, and call and off buttons. Digital keys are united in solid rows, but a good distance between the contact pads and soft rubber prevent accidental strokes and let you even work blindly. The On/Profile button is traditionally above; it is small and tight but easy to press. 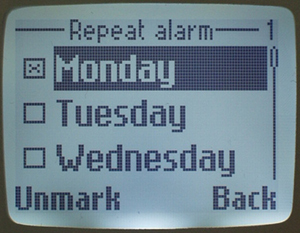 The display of Nokia 2100 is monochrome, sharp and contrast with even light blue backlight of average brightness. The background doesn't look grainy, and light and dark areas are uniform. The keypad is backlight white; the light goes through semitransparent material and makes the symbols well seen in any conditions. The management is typical of Nokia. With the left soft key you can get to the menu, go through it with a scroller, select options with the same left key, go back or open the context menu with the right key. Fortunately, the functions remain the same in all parts of menu, in contrast to many their phones where keys can change their functions depending on a window. 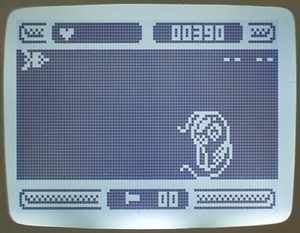 The main menu is also traditional - there is only one item on the screen at a time with an animated pictogram. Some of submenus are also displayed one by one (but without pictograms), others are displayed in groups of three. The menu structure is comprehensible; this is actually one of the strongest sides of Nokia's handhelds. In the new model the menu improved even more, making the phone pleasant and easy-to-use. The Phone Book provides 200 entries for one name and one phone number. With the right soft button you can invoke the Phone Book menu and start search by the first letter. 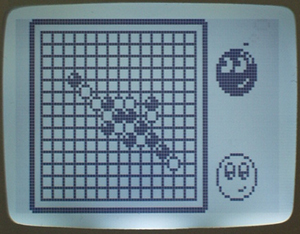 The list of entries can be displayed with the "down" key. By texting in a respective key you can quickly get a needed entry. You can set different ring tones for different people, though not in the number-editing window, but only in the Phone Book menu with the Assign tone command. 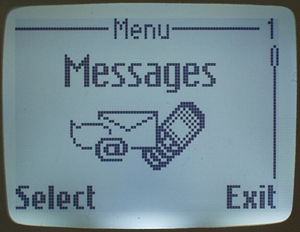 The Messages menu opens access to SMS and Nokia Picture Messaging. Beside such conventional options as a new message, folders with incoming and outgoing messages, templates and SMS chat, a user is offered SMS-to-many service, and can create his own distribution lists adding in people from the Phone Book. There is also a small library of smileys. 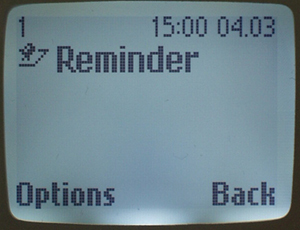 The Call register menu also sports a new option. Beside the calls lists and and payment indication there is a separate menu for the prepaid service where you request the current sum, the cost of last operations, last pay and the time of the service. But this function must be supported by your operator. The Profiles menu contains 6 profiles, with 4 of them being presets though they can be changed and renamed. Here you can find ring tones, volume level, ring types (ring, increasing signal, single tone, squeak), incoming message's tone, keys' volume level, service signals, vibra alert, Rhythmic backlight alert and screensaver. 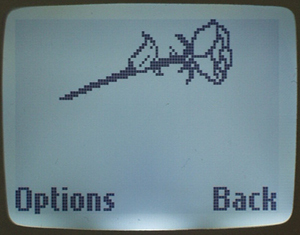 A profile can be activated from the menu by pressing the On button. The Settings menu offers standard settings. Just not that there is a keypad auto lock function. Alarm clock. It can ring once or repeat. You can tick off days of week for it to ring. A similar system is used in Siemens' phones, but they don't have a single ring. You can set only one signal but not to combine single or regular reminders. Reminders. You can set it for a desirable date and time. Games. There are three in all: Snake II, Space Impact and Link 5. All of them are traditional for Nokia. 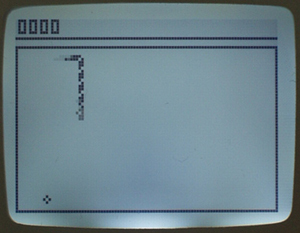 Extras menu contains a calculator with a currency converter, a stopwatch, a countdown timer, a simple graphics editor for Picture Messaging and logos, a tone editor based on codes. Our firmware version also has a Chinese Lunar Calendar, but the localized version will hardly have it. The connection quality is usual, no problems with reception in the city area. The speaker is loud enough even for noisy places. The sound quality is good as well. The ring tone is a bit louder than average. Thanks to a clear high-pitch tone it's well heard in any conditions, even under warm dress. The vibra alert is of average power and high frequency; you can nicely feel it from the holster and inside pockets, but I don't whether it's the same with outside pockets and handbags. When fully recharged, it works 4 days, with 10 minutes of talking daily, active surfing the menu and staying on at night. This is a good score, especially for a budget phone. Nokia 2100 is pleasant and easy in use thanks to the high-quality display, small dimensions, light weight, ergonomic keypad, and an unsophisticated logical menu structure. Together with good technical characteristics the phone becomes and interesting budget purchase. The model is positioned for talking only, and also because of its price niche its functionality is going to be minimal. At the same time the phone is stuffed with all functions needed for more convenient handling and working with SMS. Such options as reminders, alarm clock, calculator, currency converter, games are not removed either. Only the WAP browser is lacking. On one hand, this feature is not popular at all with users this model is meant for, but on the other hand, its competitors have it, and in this respect Nokia 2100 looks inferior. But I don't consider it a problem because of its target niche. Nokia 2100 will fight against Siemens A50 and A55, and Sony Ericsson T100. Each of them has advantages and disadvantages, but they are approximately on the same level. It means that a choice will depend on current prices, user's attitude towards trade marks and some other aspects. Nokia 2100 has every chance to get the palm of supremacy.